Dorene: It was Day Six of the Sisterhood of Salaam Shalom® Building Bridges Civil Rights Tour. I had joined the tour late on Wednesday two days earlier, and as I entered the bus that was taking us to Jummah services at Masjid Al-Muminun in Memphis, there were several seatmates already engrossed in deep conversation. Twice I approached two empty seats and was gently informed they were saved for other Sisterhood of Salaam Shalom sisters. Age 57 and I was feeling sorry for myself when a friendly woman with a smiling face indicated for me to sit next to her. Cyndy: Bus rides on the Sisterhood of Salaam Shalom Civil Rights trip are a great way to connect with new sisters, and I tried to sit with someone new each leg of the bus trip. Dorene was a new face and I had been told she just arrived on the trip. Great opportunity to meet someone seemingly very different from me. But how to begin to find common ground? Dorene: Cyndy had me from hello when she informed me she was a Jewish convert as I am a Muslim convert. Already I felt an unspoken kinship with Cyndy as converts from any religion go through common struggles and joys. As we shared the usual biographical information Cyndy mentioned her daughter attended college in upstate New York in Schenectady. I looked at her in surprise, stating, “I grew up in Plattsburgh, New York.” Cyndy’s hazel eyes opened wide when she told me she was also from Plattsburgh. Cyndy: We began as most women who are strangers begin. I shared that I live in New Jersey, and Dorene told me she lives in Charlotte. We talked about our children. Neither one of us fit the stereotype of what people think a Muslim or Jewish person looks like, and we discovered we are both converts. We were nodding and getting along. And then, we realized the next instant that we are from the same place — and I mean not just the same tiny pin dot town in upstate New York , but deeply connected by to the same values and life experience (more on that in a minute). We screamed in recognition and woke up some snoozing women on the bus! Dorene: Hardly anyone south of Albany knows where Plattsburgh is — a small town 20 miles from the Canadian border. And here, sitting on a bus in Memphis was a woman who was from the same small town. My heart was beating rapidly. I asked her where she lived in Plattsburgh, and she mentioned an even smaller town called Morrisonville (population 1,500). No way!! I grew up in Morrisonville, and further talk revealed our houses were only one mile from one another. Cyndy: I knew everything I needed to know about Dorene when I learned we attended the same beloved Catholic high school run by French brothers. Dorene was in the first class of girls admitted to the school. She was a senior when I was a freshman. This was a school of just 400 kids! How did two girls who attended a tiny Catholic school near the Canadian border end up sitting next to each other, 40 years later, on a civil rights tour bus filled with Muslim and Jewish women?! Dorene: Our words and worlds continued to overlap as we discovered we attended the same Catholic High School, Mount Assumption Institute. I did not remember Cyndy, but she was only three years behind me. After our trip, however, she sent me pictures in which we were on the Newspaper Club during the same year. When I looked at that picture, I did recollect Cyndy being part of the Newspaper Club. Cyndy: I remember Dorene. She was a cheerleader, member of the National Honor Society and Student Government and very popular. She was a senior and totally cool with perfectly feathered hair. I was a very dorky 9th grader! Dorene: Much too soon we were at the mosque. My entire being was back in 1979 Plattsburgh as Cyndy and I shared the names of teachers and classmates we both knew. Memories bubbled up that had been buried for over 25 years. As we exited the bus, I felt as if God had given me this wonderful gift to find a Sisterhood of Salaam Shalom convert sister who shared so much with me. There was a visceral connection I felt with Cyndy that I had not shared with anyone for over 35 years. Cyndy: In a moment, we went from two strangers trying to connect to instantly knowing exactly who the other person is deep down. It was a really intense experience for me and for Dorene. I was in a strange town with 50 women I had just recently met, but I felt completely known and understood by Dorene, and it was magical. All my lived years between ages 15 and 54 merged and became one. Dorene: For the next two days, if Cyndy was not in my physical presence, she was inside my head and heart. I barely slept Friday night as images from my hometown years floated through my mind — images that I wanted to share with Cyndy. On Saturday morning we had a free day in which to explore Memphis. However, we explored much more than just Memphis. At one point we were sitting on chairs that overlooked the winding Mississippi River and a huge steam-powered riverboat, and I marveled at the gift God had given to us. A former Protestant and Catholic were now part of the Sisterhood of Salaam Shalom. Our lives had started off in a similar fashion, and now our lives were similar in so many aspects. The Sisterhood of Salaam Shalom is all about making connections with others who are different from us. And if we come out of our comfort zone to broaden our world, God will send a sign that we are on a chosen journey. Cyndy: We cut an interesting picture walking around Memphis, posing with a statue of Elvis’ guitar and eating southern-style lunch. I hope we caused people to ask questions. Why are that Muslim woman and that blonde lady laughing so hard? Where are they going? How do they know each other? They looked. I hope they saw the respect and friendship we shared. Dorene: When I returned home Cyndy sent me my graduation picture from our 1979 yearbook. My senior quote sent shivers through me when I read what I had written as an 18-year-old: “As we all wander, fishing for colors of life, the colors will change.” Yes, I have wandered far from Plattsburgh since I moved away at the age of 20, but the two days I shared with Cyndy felt like a homecoming. Cyndy: In high school Dorene was Protestant, and I was Catholic. 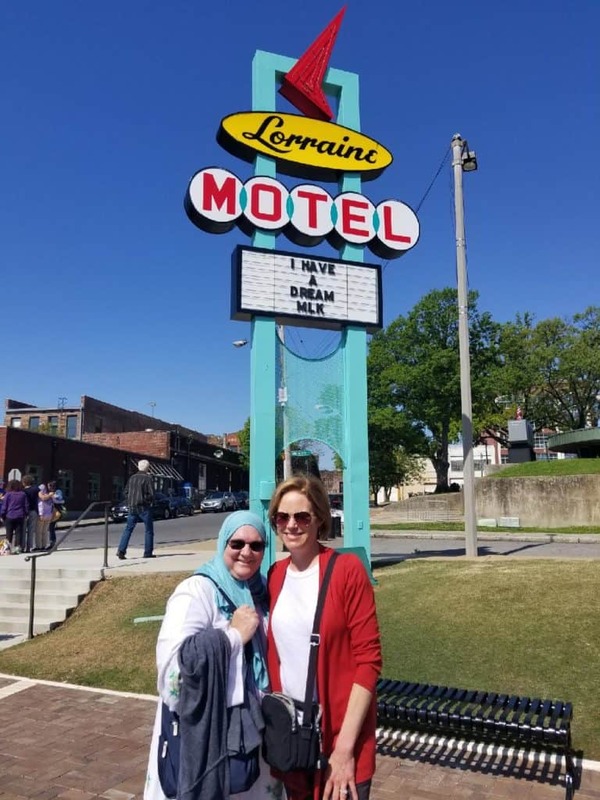 We met as participants on a civil rights trip for Muslim and Jewish women! Today if you were to pick two people out of a lineup who seemingly were most different, it might be me and Doreen! Our story shows stereotypes are barriers to sisterhood and and we are all one family. Dorene: Was this a meeting of fate — or divine intervention? That Cindy’s invitation to be her bus seatmate and our meeting occurred on the Holy Muslim day and the beginning of the Jewish Holy day makes me feel the hand of God brought us together. I can’t wait to see Cyndy at the Sisterhood of Salaam Shalom Conference in November. Even though we only shared three days together, the impact she has made in my life is immeasurable. Thanks to the Sisterhood of Salaam Shalom, my life is richer and fuller.